Podcasts are all the rage right now. We even have podcasts that review and recommend other podcasts! I'm proud to say that I'm a podcast junkie, as is most everyone I know. But did you know that your podcast addiction could actually help you manage your personal finances? Here are 10 that will improve your money mindset. Listen, Money Matters lives up to the promise of its tagline, "Manage your money like a badass." If you think personal finance is dull, Andrew Fiebert (a self-professed personal finance nerd) and Thomas Frank (a productivity expert) are here to dispel that myth. They'll help you work smarter so that your money works harder for you. They break down complex terms and host some of the smartest minds in the personal finance field. Topics range from investing to debt reduction, and everything in between. This superb NPR podcast is the gold standard when it comes to personal finance programs. Think breaking financial news meets the nuts and bolts of how our economy actually works told to you by your best friend. At almost 800 episodes, Planet Money has clearly found the secret recipe to making personal finance fascinating. Endlessly action-oriented and infinitely original, Stacking Benjamins is all about taking personal finance advice and putting it to work for you immediately. With episode titles such as "Where Financial Planning Goes Wrong" and "69 Things That GO BUMP in Your Portfolio," this podcast is so much more than tips on how to save money. It's actually changing your mind about how you view money and its place in your life. If investing is an area of personal finance you haven't delved into until now, The Money Tree is the place to grow your knowledge and personal wealth. From choosing the right investments, to making career choices, to answering your questions about pensions and Social Security, the hosts and their guest panelists for each episode will help you invest like the best. This gem from the BBC combines the latest personal finance news with brief guides on topics such as compound interest. It also offers societal commentary on topics like the future of retirement. What I like best about Money Box is that it serves up full episodes plus very short clips that tightly focus on one concept, such as energy savings and the return of the 100 percent mortgage. A personal finance expert, award-winning journalist, and best-selling author, Jean Chatzky is masterful at breaking down personal finance advice and combining that advice with what's happening in the lives of women. This mindfulness includes acknowledging finance challenges women face, such as saving for our own retirement while caring for our older loved ones, and providing timely advice based on big calendar events like back-to-school and tax prep time. Though it's geared toward women, this podcast is a winner for male listeners, too. If you're looking to expand your mind and your thinking around money, Freakonomics Radio is for you. In the tradition of their wildly successful books Freakonomics, SuperFreakonomics, and Think Like a Freak, Steven D. Levitt and Stephen J. Dubner bring together masterful storytelling with human psychology. From supply and demand through the lens of line standing, to explaining the stupidest thing you can do with your money, this highly-provocative, well-researched gem is perfect for intellectually curious listeners. Dave Ramsey approaches the management of money from a Zen place — he wants you to make peace with it so you can focus on doing what you love and spending time with people who matter to you. He recognizes the stress that money can place on your relationships and happiness, and his goal is to help you mitigate that stress with knowledge and a game plan. That perspective and motivation make the content about wealth building, reducing debt, and budgeting easy to digest. His message resonates with a wide listener base — this year he's celebrating his 25th anniversary on the air. Interviews, Q&As, deep dives into individual money topics, and career advice from a financial perspective make The Dough Roller Money Podcast one of the most well-rounded personal finance podcasts. The variety of content and format has helped Rob Berger and his 14-member team become one of the highest rated personal finance podcasts with 75,000 downloads per month. For everyone who needs their personal finance advice beautifully wrapped in a compelling story that has nothing to do with personal finance, Money for the Rest of Us is tailor-made for you. 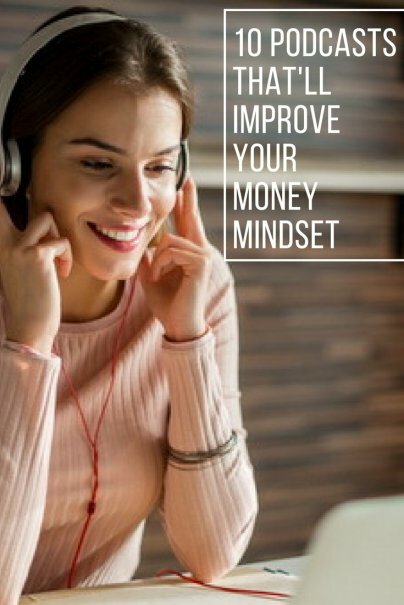 You're going to get the knowledge and lessons you need to create a money mindset, but they'll be delivered with such an immersive and entertaining narrative that you won't even realize you're learning. Some of my recent favorite episodes are "Do Homeowner Tax Breaks Cause Homelessness?" and "Is Infrastructure a Good Investment?" Combining personal finance education with social justice and impact gets people to pay attention and take action.